But 95% of that total remains overseas. Microsoft's (NASDAQ:MSFT) cash, cash equivalents, and short-term investments rose 4% sequentially to $138.5 billion last quarter. That's a massive cash cushion, but 95.4% of that war chest, or $132.1 billion, remains overseas. Microsoft, like many other multinational U.S. companies, keeps its cash in countries with lower corporate tax rates. But with the new Republican tax plan dramatically lowering corporate tax rates, should investors expect Microsoft to bring more of that cash home? The new tax plan permanently reduces the U.S. corporate tax rate from 35% to 21%, bringing rates in the U.S. closer to Canada and Ireland, which have tax rates of 15% and 12.5%, respectively. Corporations will no longer have to pay taxes on money earned abroad, while repatriated income will be taxed between 8% to 15.5%, compared to the previous rate of 35%. This gives Microsoft a big incentive to bring its cash back home. Why would Microsoft repatriate that cash? Microsoft's domestic cash, cash equivalents, and short-term investments of $6.4 billion might seem like a big enough war chest, but it's not much compared to its $94.3 billion in revenue and $32.3 billion in free cash flow over the past 12 months. Moreover, its long-term debt inched up 0.2% sequentially to $76.3 billion last quarter. Microsoft can easily manage that debt, but repatriating its overseas cash could extinguish it at a much faster pace. It could also use that cash to fund dividends, buybacks, and domestic acquisitions. Funding buybacks or acquisitions with debt was easy in a low interest rate environment, but rising interest rates will reduce the appeal of those strategies. Doing so would also be a wise PR move, since Microsoft stashes lots of cash in low-tax "havens" like Ireland, Singapore, and Puerto Rico, and has been accused of strategically moving money through countries like Luxembourg to avoid paying taxes in higher-tax countries. Microsoft pays a forward dividend yield of 1.9%, which it hiked annually for 13 straight years. It spent 52% of its earnings and 37% of its free cash flow on that dividend over the past 12 months. Bringing more of its cash back home could enable Microsoft to significantly boost its dividend. This could make it a more attractive income investment like IBM and Intel, which have forward yields of 3.9% and 2.3%, respectively. Microsoft spent $9.16 billion on buybacks over the past 12 months. 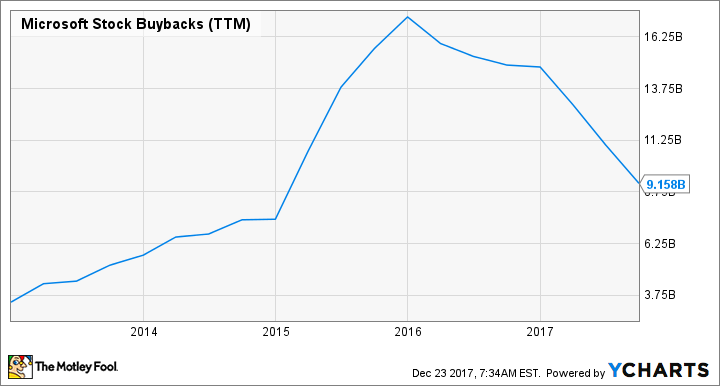 However, those buybacks started declining in 2016, as the company invested more heavily in newer mobile and cloud-based technologies. If Microsoft repatriates more cash, it can initiate bigger buybacks. This matters because Microsoft's near-40% rally this year bumped its P/E up to 30 -- which merely matches the industry average P/E for infrastructure software companies. Buying back more stock could reduce that multiple and win back conservative investors. Microsoft could also use that cash to expand its cloud business via new product launches or acquisitions. This would help its commercial cloud business -- which hit an annual run rate of $20.4 billion last quarter -- narrow its gap against public cloud market leader Amazon (NASDAQ:AMZN) Web Services (AWS). The company generates more cloud revenue overall, via software-as-a-service products like Office 365, but its cloud platform, Azure, is significantly smaller than AWS, which hit an annual run rate of almost $20 billion last quarter. But will Microsoft really bring that cash home? However, Microsoft also has reasons to keep its cash overseas. Thanks to its aforementioned tax strategies, it reported an effective tax rate of just 18% last quarter, which is significantly lower than the previous U.S. corporate tax rate of 35%. Critics of the Republican tax plan frequently cite that disparity, which counters the popular notion that U.S. companies are taxed at the "highest rates" in the developed world. Many critics also argue that if companies use repatriated cash to extinguish debt, repurchase stock, or boost dividends, it rewards investors but accomplishes little in terms of actual job creation in the U.S. The critics also argue that prior tax breaks had little impact on convincing companies to repatriate their cash and abandon their complex methods of reducing effective tax rates overseas. Investors should use companies like Microsoft as a barometer of the Republican tax plan's success. If Microsoft repatriates its cash, it could benefit shareholders in multiple ways -- although the benefit to the U.S. economy would be debatable. If it doesn't repatriate its cash, it could indicate that overseas tax havens remain more attractive than the U.S.